SRG Sites > DigiFreq > News > Blue Cat Audio Releases New Re-Guitar Plug-In - Get 10% off! 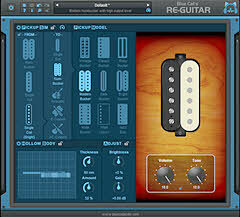 Blue Cat Audio Releases New Re-Guitar Plug-In - Get 10% off! The plug-in is included as a built-in plug-in inside Blue Cat's Axiom 1.2, the company's multi effects processor for guitar and bass that was updated today. It is also available separately as an independent plug-in, alone or within the Axe Pack guitar software bundle.